tan serio y tan rockero!!!! Cool! You look just like him. Great blog, I can test my Spanish when I visit. That more David Bow wow. Sunflower GUAPA! VERI VERI WAPPPPPPAAAAAAAAAAA! Oh It's are David wan. No flowers in our snow! Hola, las cucarañas acaban de añadirte a su lista de contactos. Cuéntanos, tú también eres de Trujillo? Vaya vaya ...Que make up más original !!! Yo sigo votando por ti, Gira...avisame cuando ya no haya que votar mas !! SuperWoof Girasol! I like your site ('specially the video clips), and I'm very waggly happy-tailed to know you liked my little site (www.philosophising.com) too! 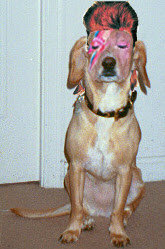 You look so cool as David Bowie! Girasol, we loved your blog and we love your crazy hair picture too. Sure looks like you live a fun life.